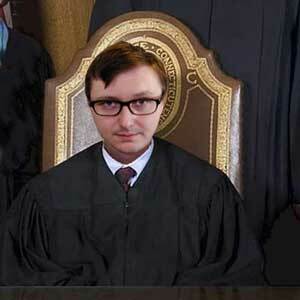 Judge John Hodgman Ep. 2: Dish Soap or Hand Soap? In episode two of the Judge John Hodgman podcast, Judge Hodgman settles a dispute between a married couple. The wife says their kitchen sink's built-in dispenser should house dish soap. The husband argues that it should hold hand soap. Only one is correct. 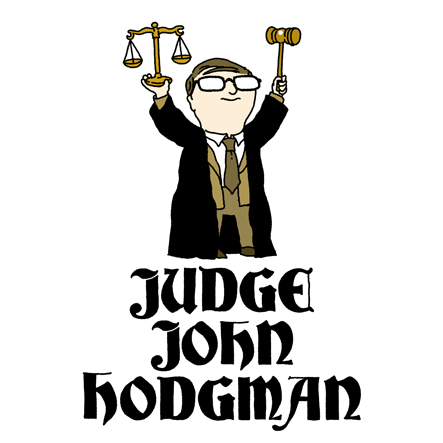 Judge John Hodgman Needs Cases! We are working on a TOP SECRET PROJECT and we need YOUR HELP. Are you involved in a dispute with a friend, relative or lover? Are you willing to submit to a HIGHER POWER to settle this dispute? If you and your fellow disputant would be willing to talk about your dispute and present your cases via telephone, Skype or in-person in Los Angeles, email hodgman@maximumfun.org with the details of your case and your telephone number. No case is too small, but disputes should be actual. There is no need to be a performer, be funny, or have a funny case. Just a genuine disagreement that needs settling by an ABSOLUTE AUTHORITY. Judge John Hodgman was due to render a decision in the upcoming episode of Jordan, Jesse GO!, but because of severe illness, explained below, he has chosen to issue a written rather than oral decision. Do my boyfriend and I have an obligation to let his mother, brother, and two small yappy dogs stay at our (600 sq. ft.) place during the holidays? Boyfriend says yes but a few Christmas' ago when we let them and their dogs stay one of her dogs was senile, had no teeth, and wore a diaper and when I tried to change it she tried to bite me. I say get a hotel. But do not be concerned about my lymph and blood loss. Even with a low-lymph supply, I am able to quickly and fairly render judgment. From an ethical point of view: you are not required to house your boyfriend's menagerie of relations and their dogs, no matter how small and yappy they all may be. This is, of course, a standard and accepted obligation of marriage. But you are not married: you are merely living in sin. If he wants to force his family on you for the holidays, I say he can come up with a ring first. From a practical point of view, you may still be tempted to offer them lodging, insofar as it is the nice thing to do and will keep the peace between you, your boyfriend, and his family. But this is only putting a diaper on a dying, senile dog, as we say in Hollywood. It is a matter of physics, not of opinion: 600 square feet is not enough to house you all. It may suit your boyfriend to deny this reality in order to avoid conflict with his own mother; but it is your job as his life companion and sinful co-habitant to help him grow up and explain to his family what any sane adult could see: five sane adults and two dogs cannot share such a space comfortably. If THEY resist this logic, you will know that they are insane, but I suspect you know this already. Under no circumstances are you required to house insane people--unless you are married. But never mind the ethical and practical implications: what's the classy thing to do? I'd suggest apologizing for not being able to accommodate them and then buying them two rooms in a clean, dog friendly, inexpensive hotel or motel nearby. It may hurt to spend that kind of money, but consider the cost of doing business as a sane, unmarried adult.